Cardinal Vincent led the National Evangelisation Conference in Birmingham on the Feast of St Benedict, 11 July 2015. In his capacity as the leader of the Church in England and Wales, he gave a rousing keynote speech to an enthusiastic audience gathered from every diocese in England and Wales. Rooting his words in the Lord's call to 'go out and make disciples of all nations', he said that the 'plan for the entire Second Vatican Council' rested on the question of how well the Church is measuring up to the call'. The Council concluded that 'in order to respond to the Saviour’s command the whole Church must be put on a missionary footing!’ Today, following the inspiration of Pope Francis in Evangelii Gaudium, Cardinal Vincent said that the call to mission is 'central' to 'all that we are and all that we want to do'. He explained that we can only do this by entering 'the heart of God, the very mystery of the Holy Trinity, the inner life of God'. It is within the 'Divine communio : the sharing within the mystery of the persons of God of divine life, love, truth, goodness and beauty' that our mission arises.
' Our colleagues who have lost their way: these can be fellow Catholics who are resting: all those who cross the threshold of the church just every now and then. They have heard of Jesus; they have some of the words; they have a familiarity, of sorts, with the Church. Can we lead them, step by step, to know Jesus more clearly? 'The curious: curiosity, even if tinged with hostility, can be a marvellous opportunity if we are open ourselves and remember that within that curiosity may well lie the prompting of the Holy Spirit. If we forget that, then we are quickly on the defensive and the moment has gone! The Cardinal also advised that individuals and parishes should let the Jubilee Year of Mercy guide their actions and choices as they contemplate where they should focus their efforts. 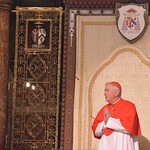 The full text of Cardinal Vincent's address can be found here. For more information and resources on Proclaim '15, please click here.